If you’re looking for an awesome hobby or a way to take amazing aerial photographs and videos, finding the best large drones is key. There are so many out there, though, you might find it a little overwhelming. That’s why we put in the time and did the research to put together this large drone buying guide. Before we get to our top products, let’s take a look at some of the important features you need to consider when shopping. Range - How far a drone is capable of flying is an important thing to keep in mind. The range is pretty wide, too, with our top picks being able to go anywhere from 98 to 1640 feet. WiFi - WiFi isn’t necessary for an awesome drone, but it does let you do some really cool things with your drone’s camera, assuming it has one. Get real-time first person view images sent right to your phone. 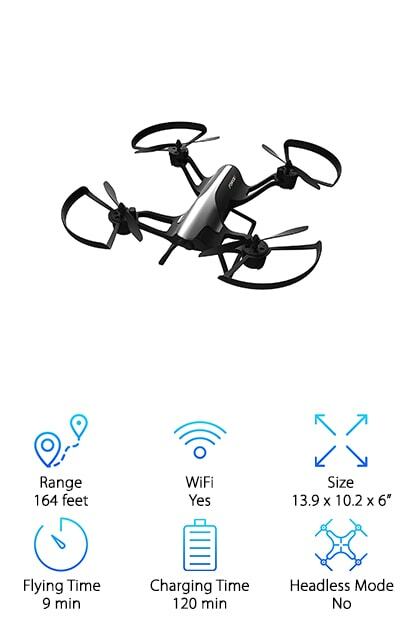 Size - These are large drones so don’t expect to be able to fold them up and put them in your pocket! They actually vary in size quite a bit so make sure you take a close look at the dimensions we’ve provided. Flying Time - Again, this varies from drone to drone. Most can fly for around 9 or 10 minutes but you will find a couple that can stay in the air for up to 20 minutes at a time! Charging Time - While some of these take quite a while to charge, others will be ready in about an hour. That said, keep in mind that you might need a little longer the first time you charge it. Headless Mode - This is a way to steer the drone without having to worry about which side is the front. Basically, you don’t have to orient yourself to the drone. Headless mode orients the drone to you. 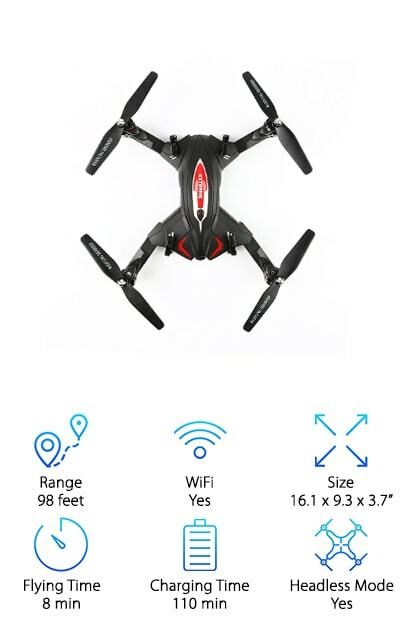 Now that you know a little more about the important features to look for when shopping, let’s fly right into our large drone reviews. Here’s how it works. We put our top and budget picks right at the top of the list. If you’re running short on time, those 2 are the best ones to start with. Keep reading to learn more about the other awesome products rounding out our list. They’re all pretty great. Alright, ready? Let’s go! If you’re looking for a large quadcopter on a budget, this Top Race 4-Channel Drone is worth checking out. For one thing, it as an HD camera that snaps photos and records video at the push of a button. Want to fly in low light? No problem, the LED lights help light up the darkness. That’s not all. It’s 6-axis gyro design give it full movements, including the ability to fly upside down and do stunt flips. If you prefer it, there’s an option to fly it in headless mode which is slightly easier for new users to learn on. And get this, there’s a 1 key return to home button that brings the drone back to the same point it took off from. Another great choice, if you’re looking for big drones, is the UDI Gyro Quadcopter. 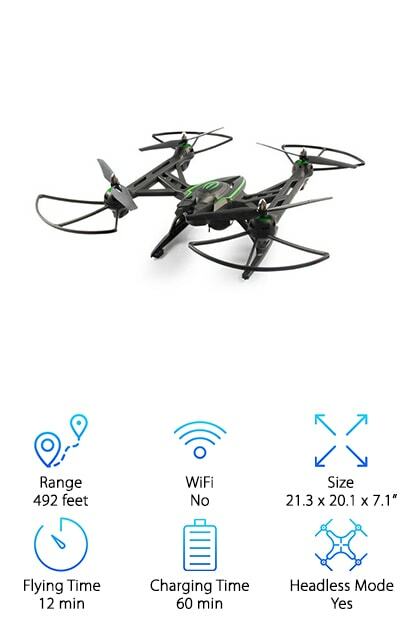 With its 6-axis gyro control, you can get good precision with this drone. That’s a good quality to have anyway in and of itself but when you combine it with the camera, it becomes even more useful. Think about it: the more control you have over the drone, the more awesome your photos and videos will be. Want to do some stunt flying? This drone can do 360 degree flips at the push of a button. This drone comes assembled and ready to fly right out of the box. If something does happen, they also include a set of 4 new propellers and a spare screwdriver so you can make any minor repairs pretty easily. When it comes to RC drones with cameras, the Force1 F72 Drone is worth checking out. What’s really cool about it is that you can shoot live video or capture images using either the remote control or an app on your mobile device. The altitude hold function is great, too, because it helps you get better pictures. Want to know another cool thing you can do with your phone? If you trace a path on the screen, the drone will follow it! This is a really cool drone for beginners, too, because it has 1 key takeoff, landing, and even flips. There’s also a headless mode which makes it just a little bit easier to steer. Plus, there are 3 different speeds to choose from. Night Lions Tech has a big quadcopter drone that performs really well even in windy conditions. One of the reasons is because it’s one of the biggest RC quadcopters we researched, but there’s a bit more to it than that. The 6 axis gyro design has a high performance motor that keeps flight steady and even. Response time between the remote and drone was really quick, too. And get this: there’s a reset you can do on the remote if you have any kind of performance issues. There’s a headless mode, too, and it can go just about any direction you want, including left and right sideward flying. That’s not all, it also includes 4 spare rotors and protective covers for maintenance and care. The DBPOWER drone has one of the best quadcopter cameras we found in our research. The camera is 720p HD but what really makes it special is the real-time WiFi transmission. You’ll see just what the drone is seeing in real time, right on your smartphone. And since we know you want to share the images you capture with your cool new drone, it’s super simple to share on social media through the app. This drone also comes with optional headless mode so flying it is a little more straightforward. It comes equipped with 1 button takeoff and landing and can do 360 degree flips at the push of a button. One more thing: it’s really durable. The frame is reinforced to give it better all-around protection. 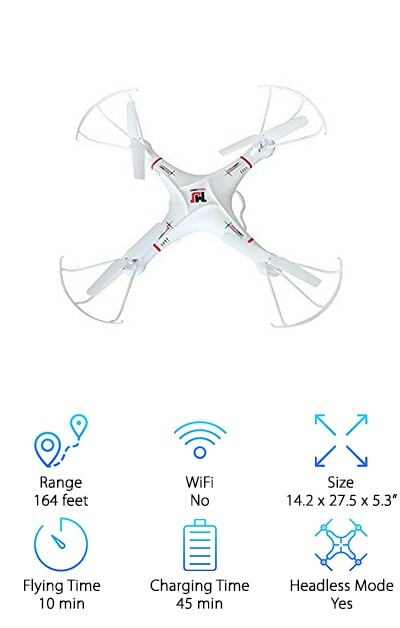 When it comes to the best big drones for sale, we have to include the LearningTech WiFi RC Quadcopter. One of the best things about it is the WiFi. It shares real-time images right to your smartphone. That’s not all, you can use your smartphone to control the drone if you prefer it to the included remote control. There’s also a special flight plan mode where the drone flies along a path that you draw on your phone screen with your finger! 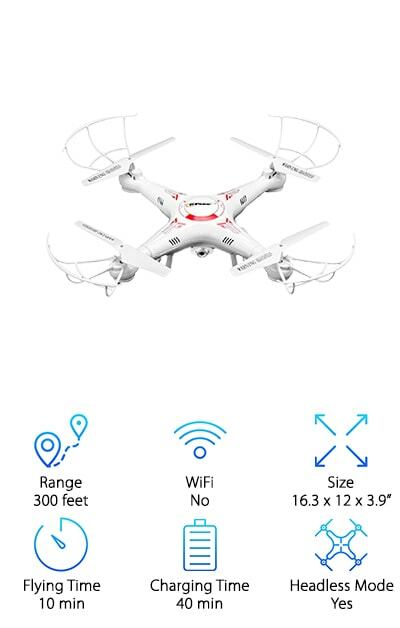 This one is also equipped with an altitude hold function that keeps it hovering, making it really easy for you to stop and shoot photos or video of something that caught your eye during flight. And get this: the blades are foldable, making it portable and more compact. The TOWO 2.4GHz Gyro Dome might be what comes to mind when you think about large drones for sale. One thing that’s cool about it is that is has a 6-axis gyroscope that makes is a fast, flexible flyer. It’s great for indoors or outdoors and is able to withstand some wind and stay on course. The simple, modular design makes charging out parts easy, too. It also has a few awesome features when it comes to flight. In addition to 360 degree flips and an optional headless setting, it has a one key return. At the push of a button, it returns and lands in the same spot it took off from. Plus, the LED lights help you easily spot it during night flights. 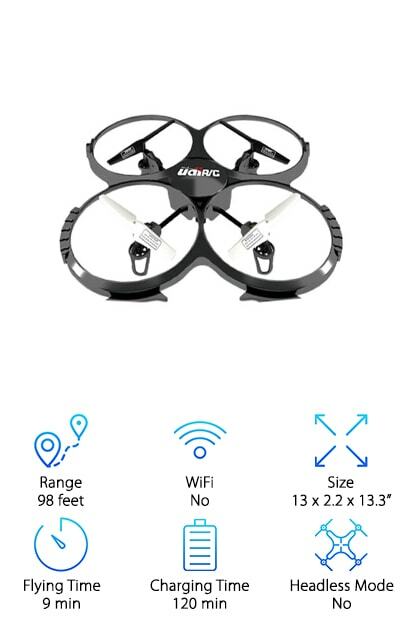 Another product that really stood out when we were researching huge drones for sale is this one from MOBU. We really like that you can control and adjust the camera angle. It makes it even easier to get the perfect photo. Combine that with the high air hovering and you’ll be able to capture some really awesome images. This one has a headless mode option for easy navigation a 1 key return to bring it back to its launch spot. Another thing that stands out about this drone is its flying time. At 12 minutes, it has one of the longest flight times of all the products we researched. And that’s not all, the charging time is pretty short, too, just 1 hour. We know that when you’re looking for quadcopter drones, looks matter. 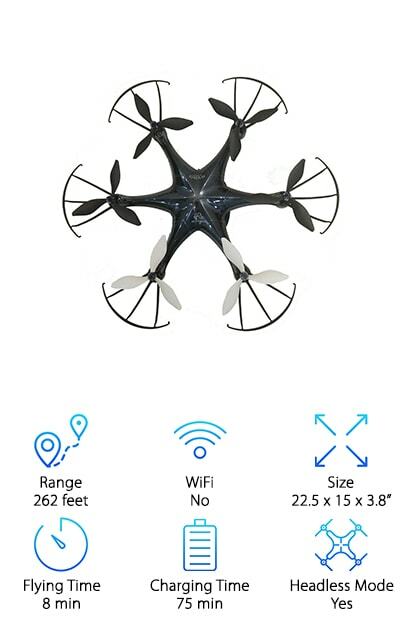 Maybe not as much as performance, but who wants an ugly drone? Well, lucky for us, the Holy Stone Large Quadcopter is awesome and looks pretty sweet, too. 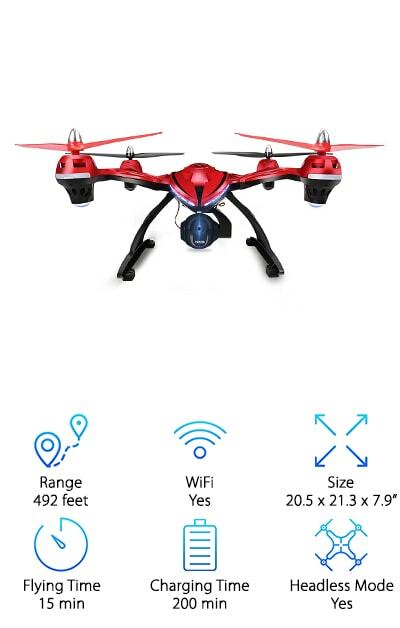 The bright red body on this one not only looks good but it makes this drone easier to spot while it’s flying (and if it gets away from you and you have to spend time looking for it later.) Another thing we really like about this one is the altitude hold function. It’s so simple! Just let go of the throttle and the drone holds its altitude. This is a great way to get some amazing pictures and videos with the 720P HD WiFi FPV camera. 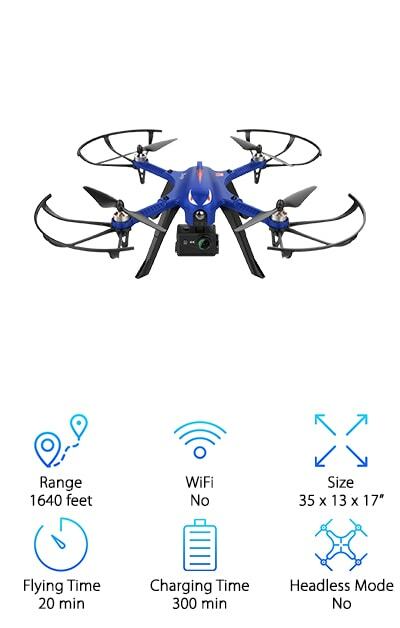 The DROCON Blue Bugs Brushless Drone is our top pick of the best large drones for sale. Thanks to the brushless motor, you can get flights of up to 20 minutes with this one. Why? They don’t overheat and risk damaging the plastic. Longer flying times also mean farther distances. In fact, this one can go as far as 1640 feet away. 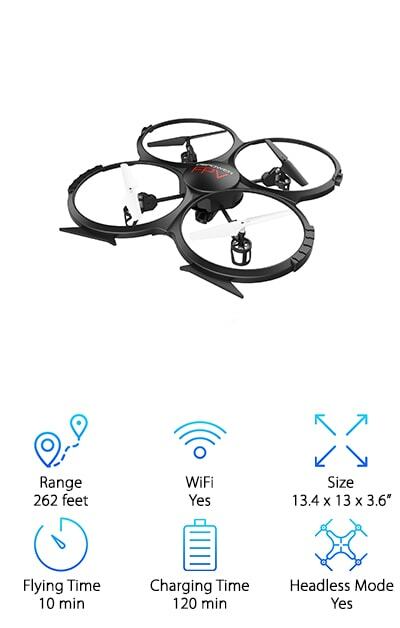 This drone is a great choice for anyone, even beginners because it delivers a stable flight that lets the user have a lot of control. Get this: the drone and the remote have 2-way communication. The remote talks to the drone and the drone talks back! That means less lag time and increased responsiveness. Oh, and one more thing. It includes a GoPro mount.